Free Golf Tips will lower your handicap. Guaranteed. Each free golf tip will teach you to putt, drive, chip, hit fairway, bunker, or tough shots - whatever you want your club to do to your ball! This doesn’t mean I’m against practice, oh no…I’m all for it…if you have the time. And if you do, I’ve got loads of free quick-hitting tips for you. But, if you don’t have time to practice, there’s plenty of hope for you and many very effective tips to drop strokes your next round! 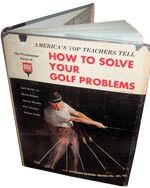 The first thing you want to do is put your email in the box above and allow me to send you a tip or two about once a week or so and also to send you my free 190 page ebook: How To Solve Your Golf Problems. You see, I know that half the problem with golf advice and the magazines is that the instruction most teachers like to give out is FAR TOO COMPLICATED and hard to actually implement. That’s why I’m keeping them short and simple. I’m a big believe that these free golf tips I’m offering can really do you some good in lowering your score, increasing your distance, and improving your accuracy in all areas of the game and MY MISSION IS TO MAKE IT SIMPLE AND FAST FOR YOU! Now, not every single tip is something you want to use for your game. Every golfer is different and so are you. It’s going to be up to you to just go out and try them…what’s really great is that many of these free golf tips are easily used inside your home, or yard or garage. I encourage you to get excited about learning again and look forward to tinkering around with your game always knowing that the journey is just as fun as the destination! p.s. You can respond to any of the emails I send you. I read and respond to everything I get!